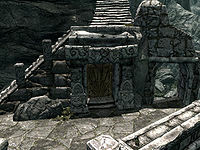 Ogmund's House is a small home in Markarth. It is the home of local bard and Speech trainer Ogmund, who usually hangs out at the Silver-Blood Inn. It is located next door to Endon's house and directly above Arnleif and Sons Trading Company. It consists of one area, Ogmund's House. Upon entering you will see this is one open room with a dining/kitchen area to the west, a raised storage in front and another raised area for sleeping to the east. Immediately on your left as you enter is a stone shelf containing a thistle branch, a snowberry sample, a bottle of Nord mead, a cup and a plate. To the right is a barrel with four wheat samples on the floor around it. Further along the wall next to the dining table is a copy of the book Fall from Glory, a garlic sample and an iron mace. On the dining table is a lute, a bottle of wine and one of Alto wine, a goblet, two bowls, two cups and various foodstuffs. Behind the dining table to the west is the kitchen area with more foodstuffs on stone shelves with a portion of dried elves ear and a garlic braid hanging from these. There is also a rack with two rabbits and a pheasant. There is a cook pot behind the table. As you climb the stairs to the storage area there is a stool with a lit candle and goblet, a chair and flute next to this and a barrel behind. Against the north wall is a stone sideboard containing a mead barrel, a plate, more food, an iron dagger, a drum, iron gauntlets and a chest (this will contain the object of the quest, if that has been started). An iron shield and boots are on the floor to the right of the chest, next to a practice dummy. The sleeping area contains a bed with a chest, a sack and a copy of Azura and the Box to the left. 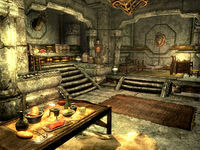 To the right of the bed is an end table with a flute on top, while a small stone table further to the right holds a copy of The Song of Pelinal, v3, one medium and one large coin purse, a goblet, a honey nut treat and two bottles of wine. To the left of the exit is a stone shelf containing a salt pile and a sweet roll on a plate, with a basket containing more foodstuffs on the floor beside it. There is a "Loot" shadowmark to the top left of the entrance door. This page was last modified on 21 November 2013, at 16:30.